Nanimarquina, Topissimo Multi teppich blau: This collection, clearly inspired by polka-dots, springs from an exploration of the rug’s third dimension and by giving the dots volume. Nanimarquina, Topissimo Multi teppich blau: This collection, clearly inspired by polka-dots, springs from an exploration of the rug’s third dimension and by giving the dots volume. The result is a practically smooth surface with a distinct touch provided by the protruding coloured tips, creating a sensation of movement that varies depending on the light. 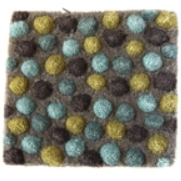 Available in two versions, multicolour or simple, mixing two shades from the same range, these polka-dot rugs can be combined in both colourful environments and in more neutral spaces that need a bit of life. This model’s innovative nature has won it major design awards.